splendid isolation: Ruff and Tuff, eh? Call me sentimental - or indeed call me anthropomorphising - but I've always felt that dugs should get Christmas presents too. 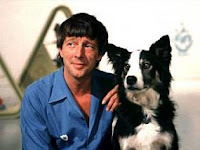 By lucky happenstance I was in the pet shop on the 24th, so I got the Wee Black Dug a new frisbee that apparently floats, which should save a shedload of money in the summer when she generally loses one every couple of days by dropping them in the Clyde. Molly on the other hand loves a toy with a good loud squeak (the more annoying, the better, if I'm honest). Longevity is always a problem with such items however; she always seems intent on getting to, and forcibly removing, the squeaker, and the toys never turn out to be terribly robust. 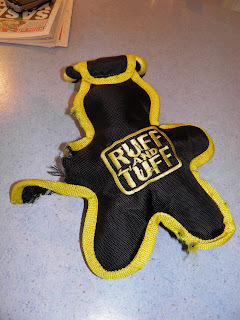 However - they had a "Ruff and Tuff" branded, black and yellow, industrial-looking, heavy duty canvassy tugger thing that felt hugely substantial...and it squeaked. A no brainer, I believe, is the term. Molly loved it. All through Christmas day, throwing it about the place, chewing it, pulling it etc, etc. Unmarked it was. Pristine, even. Result!